US China Deal to Ban Ivory Trade is Good News for Elephants Read more here. New York, New Jersey, and California all have passed laws banning the sale of ivory, with fifteen other states expected to introduce similar legislation in the coming years. Read more here and here. Obama proposes sweeping ban on U.S. Ivory Sales Read more here. California passed AB96, banning the sale of ivory and rhino horn. Voters in Washington state sent a strong message to the world on November 3 when they passed the country’s first ever comprehensive state ban on commerce in endangered animal species. Read more here. Tanzania Confident it Can Eradicate Poaching Within 4 Years. Read more here. A woman dubbed the ‘ivory kingpin’ for her alleged leadership of one of Africa’s biggest ivory smuggling operations has been charged. Read more here. Namibia’s elephant population grew by more than 70% between 2002 and 2013 from 9,600 to 16,000. Across Northern Kenya there has been a 43% decline in elephant poaching between 2012 and 2014. Read more here. Community led approach to elephant conservation has a positive impact. Read more here. Richmond, VA and Austin, TX banned the use of the bullhook. effectively making it impossible for circuses to force elephants to perform within city limits. Read more here. Holland bans the use of wildlife from performing in circuses. Read more here. 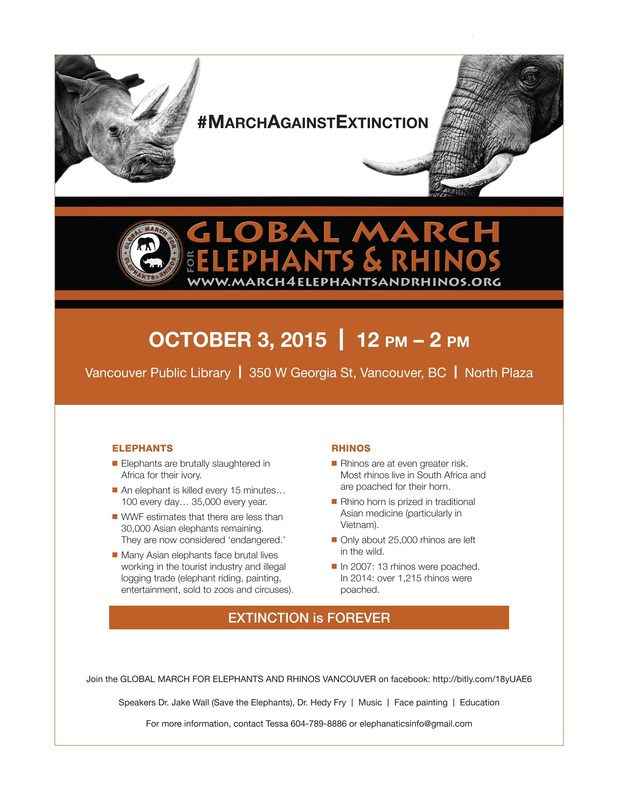 Last but not least over 130 cities all around the world marched for elephants in 2015 – with over 3,000 attending the march in Nairobi and approximately 40,000 people marching worldwide. Read more here. Elephant Nature Park, Wildlife SOS both continue to do amazing work through education and awareness and the rescue of elephants and other animals in distress. This list is by no means complete and is intended simply as a highlight. If we’ve missed something, drop us a line and we’ll add it. Together we’re making a difference. Let’s keep doing it.